The Filipina-Mexican American Idol finalist Jessica Sanchez back to the top spot AI rankings of a popular US magazine last Wednesday. Entertainment Weekly magazine placed Jessica Sanchez at No. 1. spot. If you remember last week, Sanchez slipped to No. 2 spot on the said US magazine above. 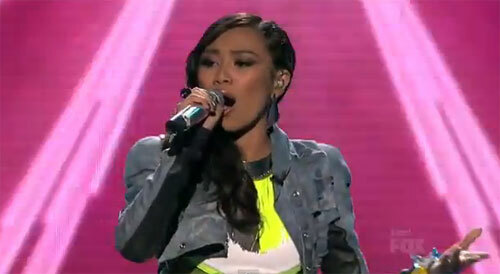 But Sanchez reclaims the number 1 rankings after she performed "How Will I Know" during the '80s week on "Idol." Although she didn't get another standing ovation from the judges this time, Sanchez still received positive comments for "How Will I Know," performances. Watch the video below as she performed the Whitney Houston song, "How Will I Know"
Meanwhile, Entertainment Weekly magazine No. 2 is Colton Dixon, who made a big jump from rank No. 5 last week. Comments or suggestions about "Jessica Sanchez back to the top spot of US Magazine" is important to us, you may share it by using the comment box below.